Ireland stands at the heart of the gripping story of Antarctic exploration. Almost every episode of triumph and tragedy and awe-inspiring endurance and unimaginable hardship in the world’s most dangerous territory involves great Irish figures who have left an indelible mark on history through their courage and indomitable will to survive. 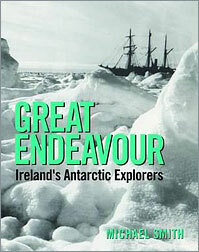 This is the first single volume to salute Ireland’s unique link with Antarctic discovery, spanning 200 years of daring exploits in the frozen wastes. It includes many previously unknown stories and photographs of early explorers and discloses why so many Irish heroes, caught up Ireland’s fight for independence, were soon forgotten. Irish characters graced Antarctic exploration from the earliest days, starting 200 years ago with the enigmatic Edward Bransfield from Cork who made the earliest sighting of the continent and Francis Crozier from Down who first mapped the icy wilderness. The charismatic Ernest Shackleton of Kildare ventured on four epic voyages and Tom Vrean, the unsung hero from Kerry, outlived most of his comrades and retired to open a pub. New light can also be shed on the overlooked Corkmen, Patrick Keohane, Robert Forde and the colourful McCarthy brothers. This book also contains the first comprehensive account of hardy 21st century Irish adventurers who trekked in the footsteps of the pioneers, including Mike Barry from Kerry, the first Irishman to walk overland to the South Pole. Other thrilling stories include those of Pat Falvey, Clare O’Leary, the first Irishwoman to march to the Pole and the courageous Mark Pollock, who overcame blindness to make the trek. Brought together for the first time, these historic episodes in the Antarctic are a powerful and compelling celebration of 200 years of great endeavour by great Irish explorers.